9.9 this episode scored on IMDb! 9.9!! The highest rated Game of Thrones episode (on IMDb, anyway). Interestingly, this episode also featured a wide range of ‘show-only’ content. Which backs up my point that with the whole Dorne thing, book readers aren’t annoyed because it’s different: they are annoyed because it’s bad. Show-only folks feel the same. But this episode greatly restored my faith (which was never really dwindling, I swear) in the writers’ ability. 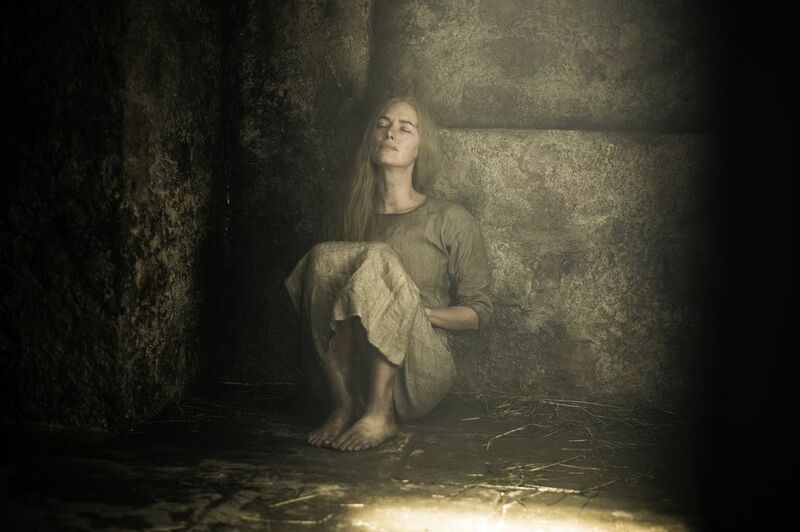 The book-to-show adaptations this week focused solely on Arya and Cersei’s stories. Cersei’s is pretty straight forward, continuing on from last week’s cliff-hanger. Arya’s, on the other hand, is slightly more convoluted and confusing. 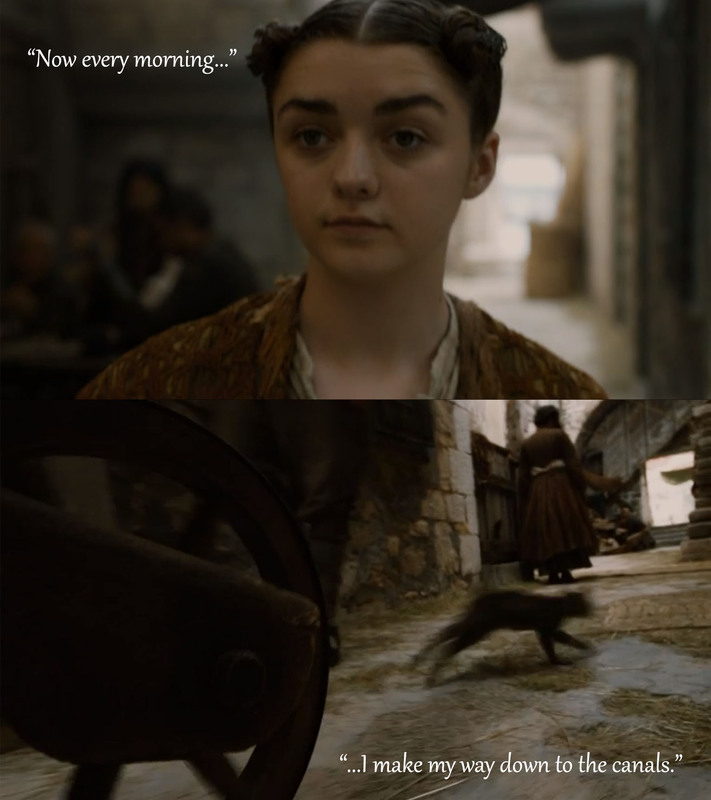 The question is, what is Arya actually doing? Well, it seems like she is training to become a Faceless Man, that’s for sure. To understand how to be another person, Arya must live the life of another person. Hence, she becomes the oyster seller. In the books, she talks the name Cat of the Canals – a nod to this can be seen during the scene when multiple cats cross her path. The ‘skinny man’ sat at the desk was essentially an insurance dealer (boo!) who had cheated a family out of their money. Arya has killed before, but for her own reasons, so it will be interesting to see how she deals with taking the life of someone who has done her no wrong. Breaking away from the books, we are treated to a fantastic couple of scenes between the little Lion and the Dragon. As Tyrion has not yet met Daenerys in the books, this is all original stuff, save the “wheel” speech, which is said to another character. As Barristan is now sadly deceased, it appears that Tyrion will be taking his role (as advisor, anyway, not knight…though that would be good). Tyrion, obviously, knows the political scape of Westeros more than Dany, and doubts she would gain many supporters. However, the Martells were Targaryen supporters until the bitter end, after years of a love/hate relationship between the two. We still haven’t really seen the extent of the Martell’s power, as they tend to keep themselves to themselves…though I’m hoping more light will be shed on them in the final two episodes of the season. Ok, time for the biggie. Beyond the Wall (which apparently has some sort of magic spell on it to stop Baby Sam from aging??) is a vast wasteland: the Lands of Always Winter. Very little is known about this area, save a few leagues from the Wall where rangers have explored. The Wildlings have scouted further, as far as Thenn, which is where the bald cannibal people from. Beyond that, however, it is largely uncharted, and the map just kind of fades off. Hardhome is a settlement situated on the east side of the Lands of Always Winter, geographically roughly the same distance north of the Wall as the Fist of the First Men (where the Night’s Watch set up camp in season 2). 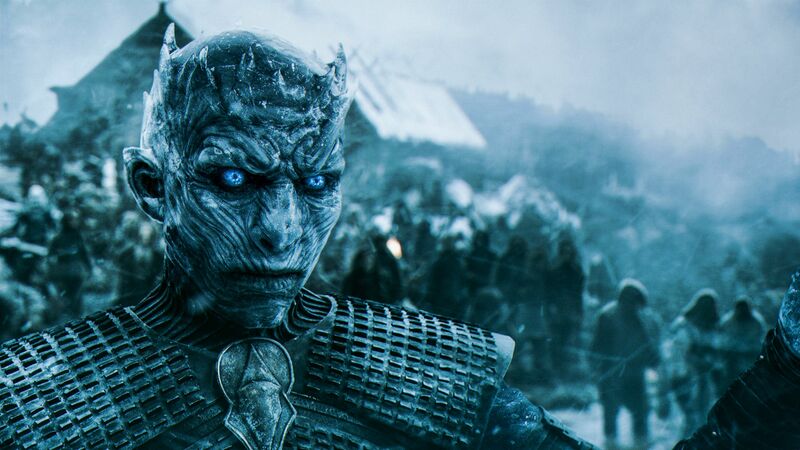 Hardhome has acted as a refuge for Free Folk all over. Leaderless, they have become shambles, and appear to be governed by a group of ‘elders’ representing each faction. We see the (brief) return of a character from season 2: Rattleshirt, or the Lord of Bones, before he is brutally bashed down by Tormund. This not only shows Tormund’s brutality, but also acts as a final nail in the coffin for another character: Mance. In the books, Melisandre puts a glamour spell on Mance, and disguises him as Rattleshirt, and vice versa. So, it’s actually Rattleshirt that dies on the pyre at Castle Black. Meanwhile, Mance goes incognito and heads south on a secret rescue mission. Book-readers may well have hoped that the same happened in the series, but, alas, it’s not to be. 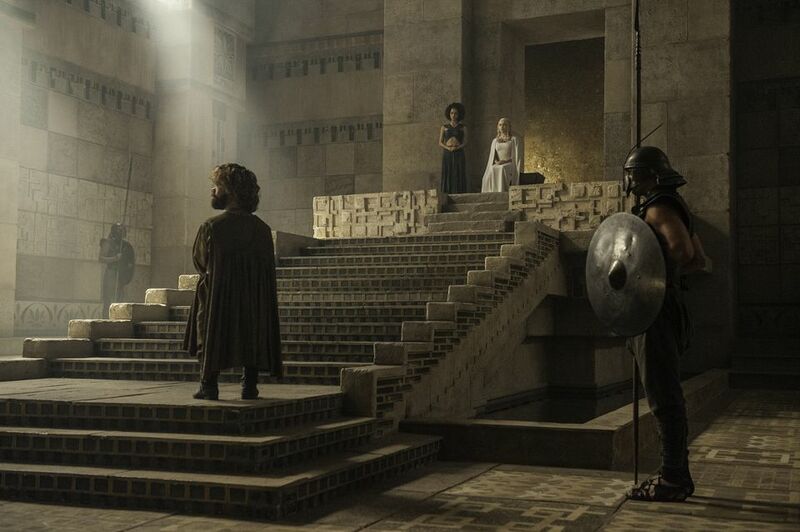 This whole final scene was brilliantly shot, with some wonderful cinematography, and, in my eyes has made up for the awful Dorne scenes (especially choreography wise). And the sound; oh, the sound! I’ll be interested to see how the rest of the Watch react to Jon bringing bands of Wildlings and a Giant (whose name is Wun Weg Wun Dar Wun, or Wun Wun for short, if you were interested) to the Wall. Also, I’m awfully suspicious about that hooded figure navigating Jon’s boat at the end. He didn’t even turn round! I was half expecting it to be some sort of disguised White Walker…or, and I had my fingers crossed for this, that we would hear a voice “Jon?” *Jon looks down* “Uncle Benjen? !” BLACKOUT! Next week’s episode is titled The Dance of Dragons, which is an obvious allusion to the title of the fifth book, A Dance with Dragons. 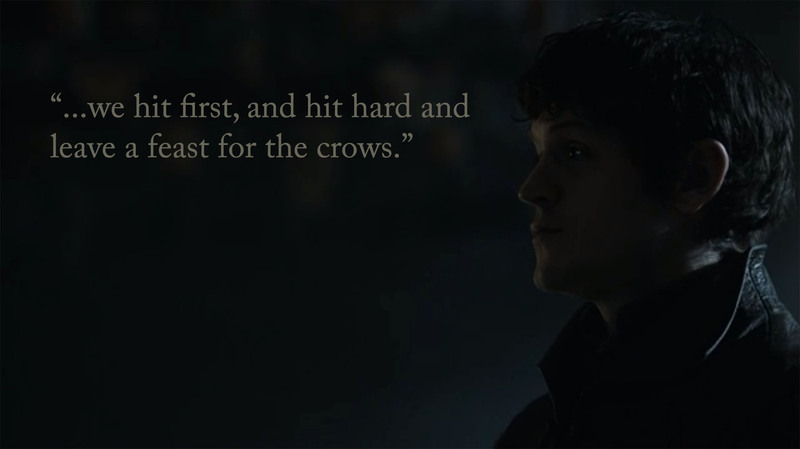 Ramsay also mentioned how he would leave Stannis’ army as “a feast for the crows”, which is a nice little nod to the title of the fourth book, A Feast for Crows. Whether you think this season has been slow or not, it’s definitely apparent that it’s picking up now, with next week’s episode looking pretty darn epic, and episode ten will apparently “break the internet”…! Also, Oberyn died this time last year. Just saying. This entry was posted in Blog and tagged A Dance With Dragons, A Feast For Crows, a song of ice and fire, arya, asoiaf, benioff, Benjen, Braavos, Cat, cersei, daenerys, Dany, Dragonglass, episode 8, Episode Companion, Free Folk, game of thrones, Giant, got, Hardhome, hbo, jon snow, Jorah, Lands of Always Winter, lannister, Lord of Bones, martell, Others, Qyburn, Ramsay, Rattleshirt, reek, review, samwell, sansa, Season 5, Stark, Targaryen, Theon, Tormund, Tyrell, tyrion, Undead, Valyrian Steel, Wall, weiss, Wheel, White Walkers, Wights, Wildlings, Wun Wun, Zombies.